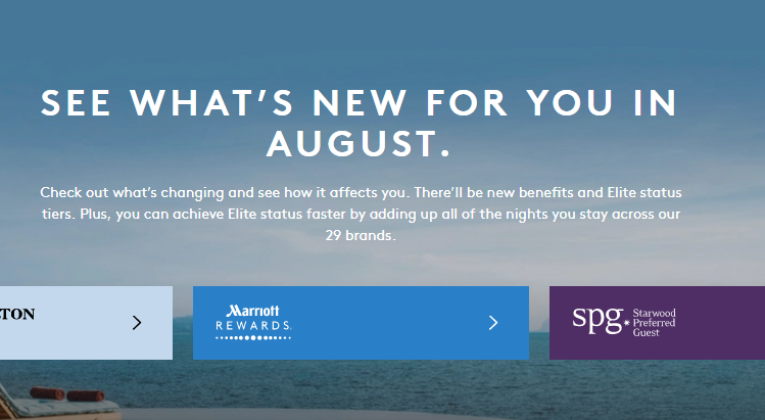 What Will Platinum Status Actually Get You at Marriott / Starwood Hotels? If the hotel lounge happens to be temporarily closed (weekends, holidays, etc. ), the hotel must offer breakfast in the restaurant to the member + one guest OR 750 Marriott points. Click here for the chart provided by Marriott. It is worth noting that the Courtyard brand is not normally associated with executive lounges. However some Courtyard hotels – especially in Asia – do indeed have a lounge and a Platinum member would accordingly receive access. 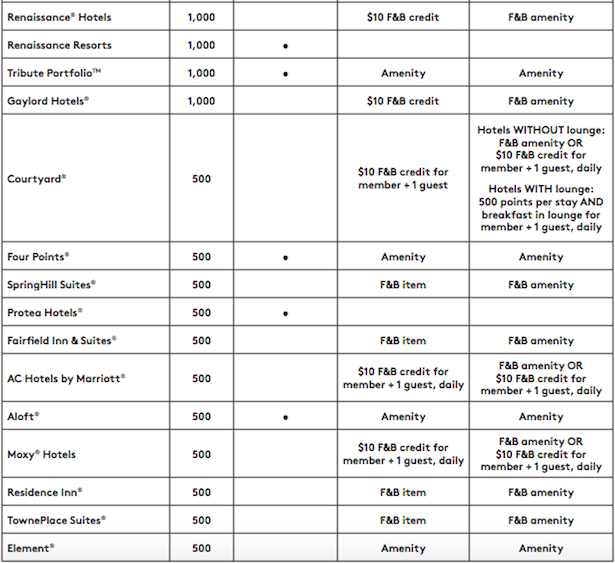 Marriott has provided a chart that attempts to outline the Platinum Elite Welcome Gift Options. For many of us Platinum elites, that really means whether or not we get a free breakfast… But since some travellers can either reclaim their breakfast costs on corporate expenses, or prefer a quick coffee, many hotel chains offer an alternative. Platinum members are not going to be fed at these brands – Design Hotels, EDITION, Ritz-Carlton, Marriott Executive Apartments, and Marriott Vacation Club. No confusion here. It might be in the lounge or it might be in the restaurant, but all Platinum members will receive breakfast at: St. Regis, Luxury Collection, Westin, Sheraton, W, Le Meridien, Tribute Portfolio, Four Points, Aloft. Platinum members will now receive complimentary breakfast in the restaurant at Protea Hotels. Simple and straightforward. Marriott’s chart doesn’t place a dot against breakfast for certain brands, but only because breakfast is brand standard (i.e. like we all know that breakfast is free at Holiday Inn Express or Hampton Inn hotels) and is already included in your room rate. The brands where this policy applies are: Element, Fairfield, Residence Inn, TownePlace Suites, Springhill Suites. Marriott could be far clearer, but it is my understanding that these brands are expected to have a lounge. Therefore Platinum members are supposed to eat their breakfast in the lounge (rather than the restaurant): JW Marriott, Marriott, Delta, Autograph Collection, Renaissance. If the hotel doesn’t offer a lounge, then it is supposed to offer breakfast in the restaurant and you would still be entitled to the 500/1,000 bonus points or the local amenity. Apparently it was simply too difficult for Marriott to agree with its franchisees to offer complimentary breakfast to Platinum members at these brands: Courtyard, AC Hotels, Gaylord, Moxy. As a result, Platinum members should receive a $10 credit per day (£7-8) to apply against food and beverage expenses charged to the room. In most hotels, this won’t cover the entire cost of a restaurant breakfast. But it should cover a couple of drinks in the bar, which might make some InsideFlyer contributors happier… 😉 Of course, some hotels might also decide to offer complimentary breakfast instead of messing about with the $10 credit. Do you still get all of these if you are staying on points or a Travel Package certificate ? Yes. There is never a distinction in benefits between paid and award stays. I don’t buy the difficulty with the franchise argument. It’s easier to fill these rooms because they’re cheaper and in better locations so more likely they can sting people for breakfast. Think Holiday Inn rather than Holiday Inn Express. Marriott said we would get breakfast at Courtyards and they renegaded on it. 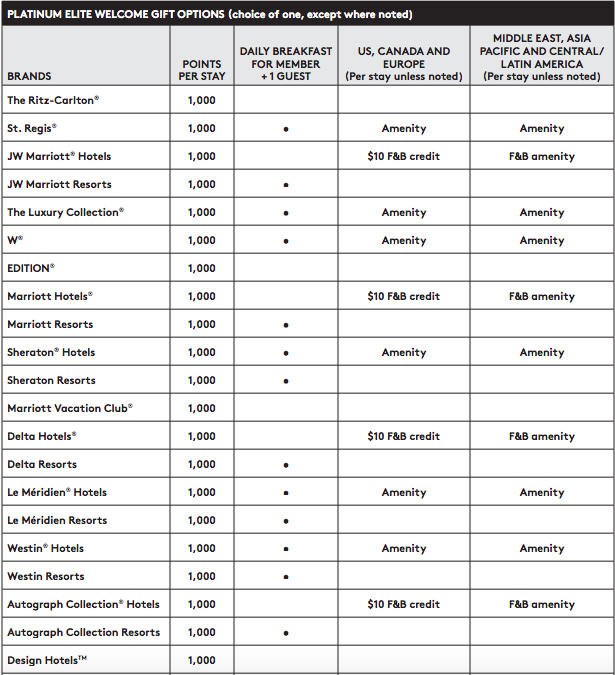 On another related tack I’ve noticed a fair few Starwood properties are now selling nights for cash with breakfast included with no availability for standard rooms without breakfast, which for platinum is already covered. You’re effectively paying for breakfast twice if you’re platinum or above. As for breakfast-inclusive rates, there are often tax or other reasons explaining it. I’ve found in Colombia for example that choosing a no-breakfast rate means I must pay VAT, but if you pay a “package rate” (i.e. room + BF) you are exempt. $10 credit for Courtyard and AC is a joke. That will get you one cup of machine coffee and half a boiled egg. Trust Marriott with their spreadsheet mentality to muddy the waters. Don’t expect SPG type upgrades as a Platinum either. They seem to have the Hilton approach of never giving out proper upgrades unless you beg for them. Two years as a Plat and the only meaningful upgrades I’ve had are those where I specifically rang the FD in advance to ask for them. What about Platinum Pro? is there any real value to this higher status being grandfathered by the end of 2018? We won’t know until we know. Platinum Premier will get more bonus points, and you may be ranked at a higher priority for upgrades. I’d have to double-check whether lifetime status automatically gets you the 50 and 75 night gifts. Making it a one-off opportunity is a clever way of getting people to aim for the lifetime status without anybody really knowing whether it’s worth it.